Beets are a nutritious vegetable and benefit your body in so many ways! They are packed full of vitamins, minerals, and organic compounds like carotenoids, lutein/zeaxanthin, glycine, betaine, dietary fiber, vitamin C, magnesium, iron, copper, and phosphorus. Beets are also high in nitrates which help with increasing overall blood flow and circulation which can help enhance athletic performance. 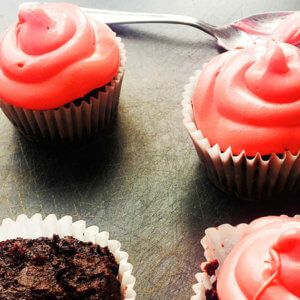 AND beets make a great addition to cupcakes! Sweet and earthy beets add moisture to baked goods without the addition of oil or butter, and they also add a natural sweetness. They’re most commonly used in chocolate desserts because they add moisture, yet the cocoa powder and chocolate mask any possible subtle earthy flavor. 1. Combine the first three ingredients in a bowl. 2. Grate the beets finely, then put into a blender and mix on high until completely smooth. Melt the oil and combine with the beets. Put the mixture into the bowl with the other ingredients. Mix well. 3. 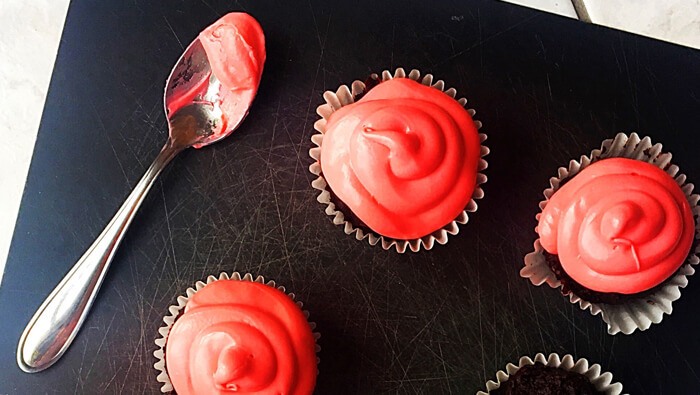 Spoon the batter into cupcake liners and bake for 15-20 minutes at 350 degrees F. The cupcakes are ready when the tops are hard and the inside is cooked through.